Nevertheless, I didn’t want to upset my guest, so I changed up my weekly cooking schedule and cooked them for lunch today. Served with some minced tofu (traditionally this dish is served with pork and I give you that choice below), my vegan version was spiced with Thai basil, chilli, garlic, ginger and sweet soy sauce. I need not say more. It was a delectable combination indeed. I should convince Loz, that snake beans are not so scary… She would like this! If you can’t find snakebeans you can use normal green beans instead. Trim and cut in half. Pork mince could be substituted for tofu. Simply remove beens after they’ve been cooked and cook pork mince in the remaining sauce for 10 or so minutes, stir frying to break up into little pieces. Prepare all ingredients before you start cooking. To make the stir fry: cut beans to about 2in in length. Heat oil in a wok over medium heat. Add minced garlic, ginger and sliced chilli and cook for a minute until fragrant. Add beans and stir fry for about 5 minutes. Add soy sauce and sugar and mix all together. Turn off the heat and cover the beans with a stainless steel bowl or a heatproof bowl. Allow to steam for 10 minutes to soften the beans and infuse the flavours. In the meantime, chop tofu into small cubes. Once ready, add chopped spring onions and stir through. For a pork version see note above. To serve: Transfer spiced beans onto your serving plate. Top with diced tofu, crushed peanuts. Drizzle with the sauce left over in the wok. Sprinkle with extra chilli if you like. this does look great but as i said, snake beans creep me out. i’m odd & i know it. so does the blogging world, finally! Oh, Laura, look what you passed up—these look wonderful! This looks so delicious and the photos are amazing too! Good post . Here in Manila ,,we call snake beans .. ” sitaw ” 🙂 and that’s one of my favorite vegetables! Cheers! Yes, I’ve heard it’s a popular bean in the Philippines. I really liked it so keen to learn a few more recipes. Laura’s loss it seems:) I haven’t eaten this for a while. They’re not made from real snakes StarLoz…honest. I’m going to make this at home…looks tasty and simple. My two favourite things when cooking. I’ve never cooked with these bean before. This looks and sounds wonderful. Love this dish, regarless of whether it’s made with tofu or pork! Snake beans also make me think of Mum – if not in a stir-fry, she’d chop them into tiny bits and throw them in with scrambled eggs. Okay, so now I really want to go out and find snake beans…never heard of them before this. But I think I might love them. The tofu is a great touch! I must admit I love beans of any description and these look full of flavour. 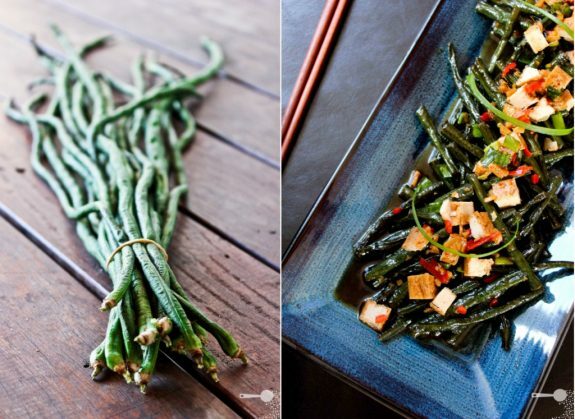 I love those snake beans (we call them “long beans”) – even as a kid, they’re so good. And your preparation sounds so good, and spicy. Yum! They have a slightly different, more soft but “meatier” texture, I’ve found. I love snake beans, we don’t see them often in NZ but you should see people’s faces when we do! Love your recipe. Love this blog. Just found it. The stir fry is beautiful. This looks so good, but the best thing is how it’s served!